c.1979? | age 11? I don’t know if it’s the same for you, but this page depicting the death of poor Biggs, is one of about 2 pages in Star Wars age 9 which really, truly affects me. It delivers an emotional punch. –Star Wars age 9, 1979? It’s the final curtain for Biggs. I really get affected by this page which I must have drawn when quite young. It looks to have been enhanced later with colour and black marker. For all of its roughness it still gets me ‘right here’. It’s an earlier page than the one preceding it, and the one that will follow, but I must have thought it was worth keeping in the sequence of newer stuff. Maybe I didn’t think I could out-do it? It looks like I did still touch it up with the black marker that I’d used on those other pages though. And maybe excitedly and boldly scrawled in the explosive “BIGGS” speech balloon with the big thick black permanent marker for high-impact. Biggs’ exploding X-Wing was probably also later touched-up in red pen. It makes it look like a super-imposed movie special effect, with the background showing through. How do you like how Luke’s teeth have been shown to have a thickness to them? In the film, Luke’s reaction is very controlled and stoic. The farmboy of a couple of days ago bears the hallmark of a seasoned veteran; putting his emotions aside and getting on with the job. In mere minutes, the Empire will be within firing distance of the Rebel base. But no such restraint here. Biggs’ destruction takes up only 2 square inches or so, in the top-left of the page. A mere blip in the vastness of space. But the real drama takes place – in extreme closeup – in Luke’s cockpit. It’s over half of the page. 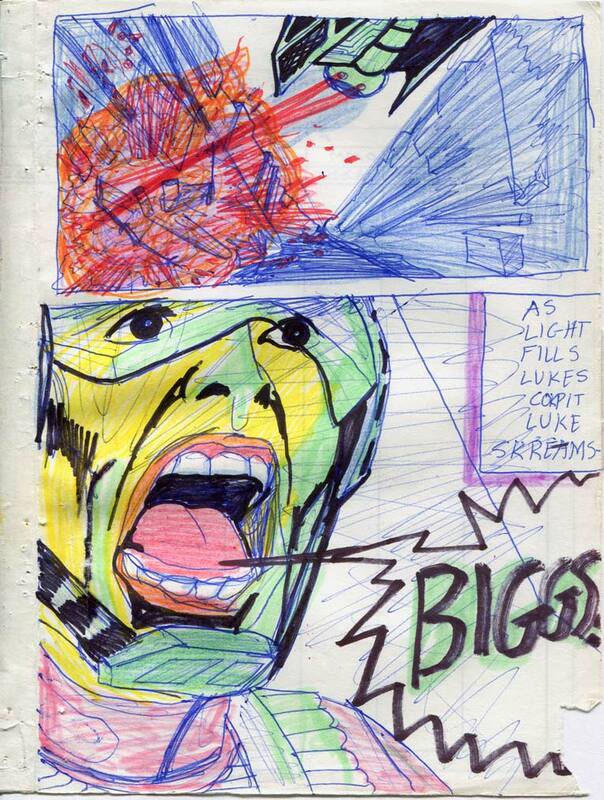 I wonder where this big-mouthed Luke came from: One of my Logan’s Run comics? When Logan yells “FRANCIS – NOOOO!” Or one of my amazing Tomb of Dracula comic’s images of Blade? Or, just maybe–precociously–my own imagination. Thanks Dan. It’s pretty bold! The green highlighter was used simply because it was the only day-glo colour that I had. I’m sure I would’ve used orange or pink if I’d had it. The Simpsons’ yellow is – as usual – a weird one! Poor Tom. But remember… Biggs will be with you. Always. At ‘Blue Milk Special’ webcomic. Your predilection for the letter K was way ahead of your time (before marketers decided to purposefully dumb-down society). That said, Cok is an awesome word. What drama! If I were making a super re-release UV ray version, I’d splice your reaction by Luke into the movie! Thanks Scot. I think nowadays in movies you’d see a more dramatic reaction like that.